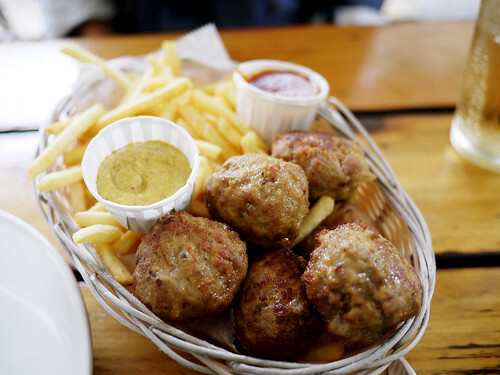 Even though we were hankering after the weisswurst at Loreley, when we read this description "pork meatballs in a basket", there was no question we wouldn't try it. Meatballs in a Basket! That's just awesome. And sure enough they came out exactly as described. M. said this meal is like MacDonald's for adults. If you're thinking of Loreley as a quiet place for lunch, make sure there are no Euro Cup games scheduled during lunch. That's the most people we have ever seen there during the day.